The Galion 100U body is designed for superior service on 9900-19500 GVWR cab/chassis'. It features all 10 gauge high tensile steel floors, tailgate, head sheets and double wall sides. Front corner posts, two intermediate side braces, full depth rear corner posts and boxed "material-shedding" top rails are also standard. 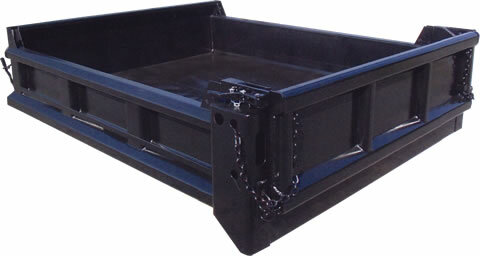 Available in inside lengths from 8' through 11', 84" inside width with 12" sides and 18" gate or 16" sides and 22" gate. 10 gauge high tensile steel with double wall sides, material shedding boxed top rails, full depth 10" rear corner post, front side brace, two intermediate vertical side braces and 6" front and rear board extension pockets. 10 gauge high tensile steel, with 2" radius floor to side radius. 10 gauge high tensile steel construction with two bend top flange. 10 gauge high tensile steel with full perimeter box bracing, two intermediate vertical box braces, double acting design with long chains and two set of banjo eyes. Heavy duty cast quick release top hardware and cast overshot lower hardware with manual release handle. Stacked design utilizing 6" structural longitudinals gusseted to 3" structural channel crossmembers on 12" centers, lubricated front and rear cross shaft and full width rear bolster. All Galion 100U bodies are shipped with a "body-up" warning light and OSHA required back up alarm.